Dr. Gration commenced General Practice in 1993 and began at Belgrave Medical Clinic in 2001. Dr. Gration became the Practice Principal of Belgrave Medical Clinic in 2005. His main focus/attention is whole life Medicine. After Graduate training at Alfred Hospital (Melbourne), Dr. Gration completed his Post Graduate training in Orthopaedics, Emergency Medicine, General Medicine, General Surgery, Paediatrics, Obstetrics and Gynaecology, Rehabilitation Medicine and Psychiatry. During training Dr. Gration worked at Box Hill Hospital, Larundel Psychiatric Hospital, Peter James Centre and Angliss Hospital. 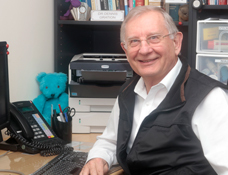 Dr. Gration was also the Clinical Supervisor at Angliss Hospital 1997 – 2000. Dennis is interested in the development of the process of medicine. In his spare time Dr. Gration enjoys saltwater fishing, growing indigenous plants and caring for the environment.